Madagascar is an animated film featuring four bumbling animals who find themselves shipped back to the wild after growing up for years in the Bronx Zoo, the captive animal life of luxury. 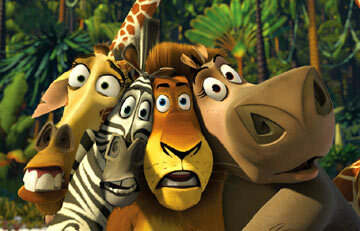 Ben Stiller plays Alex the Lion, and Chris Rock his side-kick Marty the Zebra. They are partnered with Jada Pinkett Smith as Gloria the Hippo and David Schwimmer as Melman the hypocondriac/Girraffe and a team of escape artist Penguins. If this had come first before all of the other animated films of the past few years, this may have been considered a great one. Unfortunately it stood no chance but to be compared - unfairly perhaps - to classics like Shrek, Finding Nemo and Toy Story. While Madagascar found ways to amuse the adults with over-the-kid's-heads humor, it didn't pack enough of it to be more than mildly entertaining, and paled in comparison to the the aforementioned block-busters. Kids will still love this movie, but for adults it was good but not great - somewhat equivalent on the meter to Shark Tales and Robots. This was just OK. I'm getting tired of Jon Favreau always playing the same guy and always making himself look like a saint. A nifty bit of trivia: "Made" is co-produced by Peter Billingsley, a friend of Favreau, the little boy Ralphie in "A Christmas Story"-- a truly great film. The Jennifer Lopez vehicle Maid in Manhattan made me think about why I like the formula movies I like, and I decided that they have most or all of these things in common: they don't require a complete lobotomy of the higher reasoning centers of the brain to be enjoyed, they do something of some originality with the old clichés, they are fun enough to watch that my disbelief gets suspended, and (perhaps most importantly) they have good, believable acting. Maid in Manhattan doesn't make it on most of these criteria, especially the last one. It's not that J. Lo is even that bad an actress; she's generally convincing as the Tough, Opinionated Single Mother and Hard Worker who is now the Only Acceptable Version of Cinderella for modern audiences. Ralph Fiennes, playing a politician and the (newly) Sensitive Single Rich Guy/Prince Charming she longs for, isn't horrible either, although he needs to keep the American accent a little more consistently. No, the worst performances are actually a trio of Fellow Working-Class Women, three other maids at the hotel, led by an annoying Best Friend (Lisa Roberts). To me, they were much more like actresses playing maids than they were like maids, which is exactly what I shouldn't be thinking in the middle of this kind of movie. The script didn't help matters much either, and it was particularly not helpful to the Fellow Women. In one scene, they seemed to go from viciously "don't get above your station" intolerant of J. Lo to supportive of her in the space of about twenty seconds for no adequately explored reason! Not that they were the only victims; the script doesn't quite know what to do with the good side performers either, including the brilliant Chris Eigeman (from Metropolitan and Kicking and Screaming) as the hotel manager, Stanley Tucci (from Big Night) as an irritating cliché of a political operative, and Bob Hoskins as a butler and J. Lo's supervisor. Hoskins' character likes his employee, but seems to want to smother her relationship, as if the writer couldn't figure out whether to make him likable or threatening! Good touches, including a clever ending sequence, Wayne Wang's excellent (as usual) direction, and worthwhile child acting by the youngster playing J.Lo's son (Tyler Posey), end up wasted on the kind of slight and trite story that gives formula movies a bad name. Of course, I suppose I should have known this going into the whole thing! They're not there to shop. They're not there to work. They're just there. (If it wasn't for video boxes, I'd have no idea what to write.) If you don't like stupid movies that are hilarious, don't watch. If you do, it's a must see. If you liked "Clerks," it's the next movie in the series, you'll love it. This is a hard film to rate. If you like violent, disturbing movies check it out. If not, and I don't, this is not the movie for you. One piece of information to note: There are some subtitles during conversations held in Spanish, though they aren't distracting. All the actors do a good job with their roles. I'd suggest not much would be lost waiting for the rental. I saw it on TV again yesterday and it just makes me laugh. Bill Murray's best vehicle to date. First of all, this isn't a "movie" even though it played in theaters. 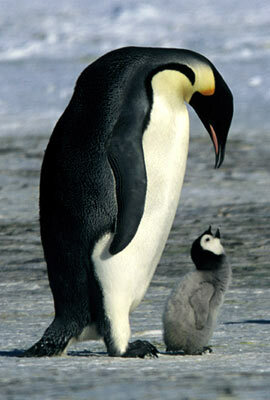 This is very much a documentary on the Emperor Penguins who make their home in Antarctica. That said, this is pretty damn cool. Fascinating. Just as an example, the title of the movie comes from the fact that every year hundreds of these penguins suddenly decide to walk 70 miles to the same place to breed ... and they do it single file. 70 MILES! You've seen penguins walk. It's the coolest thing. These penguins walking single file in a line that's as long as you can see. And that's just the beginning. Very interesting stuff. One of my favorite actors, Russell Crowe, plays Lucky Jack Aubrey, a captain of a British fighting ship in 1805. The oceans were battlefields during that time period, and Aubrey and his massive ship and crew were faced with the task of keeping the French from taking the war to the Pacific. Just north of Brazil in the Atlantic their ship is badly damaged, and many killed when they are surprised by an attack by a far superior French ship. They elude their ultimate capture, and then begin a journey to stop the French ship on its way to the Pacific. Bev also found that their heavy accents - although probably realistic - made it difficult for her to follow the dialog. Still, it wasn't a bad movie, but I would rank this towards the bottom of Crowe's filmography. This was not at all his fault, however. The acting was on target. The story just didn't seem to move me like all of the other movies he's played. The special effects are spectacular. The battle scenes, and this massive 1800 vintage sailing gunship traversing a storm in the ocean is worth seeing. How they filmed some of these scenes is beyond the comprehension of my imagination. This movie struck me as one that would have the critics raving, but not the general public. So I was not surprised when I checked Yahoo Movies and saw that the critics' average score was an "A-" and the Yahoo users rated it a solid "B." I paid twice to see this movie while in the local theater. And, I bought it in DVD the first day it was available. This is a first rate Sci-Fi movie. Keanu Reeves is a hacker named Neo who follows the White Rabbit. The special effects are exceptional as witnessed by several recent Oscars for same. Laurence Fishburne is a believable, if stiff, Morpheus and Carrie-Anne Moss will keep your attention [if you like babes prancing around in tight leather]. Finally, Joe Pantoliano [US Marshals] turns in yet one more solid supporting performance. All in all worth the time spent! Just remember, Coppertop, that which pill you choose to swallow will always change your life! Well, I finally watched it, so I guess now everyone has seen this movie. I don't get it. No, the movie I did get, despite the bizarre plot. What I didn't get was what all of the hub-bub was about. (I like that word, "Hub-bub," by the way.) The effects were cool, but I've seen cooler. The characters were generally all pretty morbid. The plot had a LOT of holes. Do you think sometimes an idea can be so complex and "out there" that there's just no way to transfer it into a tangible story? I wouldn't go so far to say the plot was clever, just complex. It's like someone had this neat idea, but couldn't figure out how to make it all fit together and make a lot of sense. So instead of working it out, they covered it with window dressing (read: affects) and overacting, and - waa-laa! - you have "The Matrix." It had some good points, and it wasn't a terrible movie, but much of it was a little too contrived and forced. If I *could* give this a negative numbered rating, I would. I loathed this movie!!! Too bleak. The characters were unappealing (including the so-called "good guys" of the plot). Plot line--what *was* the plot?!?!!!!! Totally a painful waste of 2 hours--even with watching it on DVD. You'd like this movie if you like Kung-Fu routines and if you're a boy between the ages of 10 and 13. (I thought the Kung-Fu-like routines were *quite* contrived.) But, hey, what do I know... someone figured that they could make money off this abomination! Unreal special effects. This is an "action for the sake of action" movie. If you go there with any other expectations you may be disappointed. The movie stars Keanu Reeves one of the few native Hawaiians to become established in Hollywood. On a lark, I looked up the name Keanu in a Hawaiian language dictionary. The translation means, "he who acts poorly". Did I mention that the special effects ARE UNREAL? Worth seeing on the big screen for the action sequences. The word of the movie is hunger. Why, you ask...because I opened the dictionary to a page and that was the first word I saw. If you look at the second definition of the word it reads, "the painful sensation or state of weakness caused by the need for food". That would be a good analogy for this movie - it was painful and weak because the acting needed nourishment! I think Keanu took acting lessons to get worse. And the rest of the cast followed his lead. In the words of the narrator from the Grinch..."stink, stank, stunk". In a way - particularly regarding the humor - this was "There's Something About Mary?" Part II. If you thought "Mary" was a great movie, you'll probably like this too, although I thought "Mary" was a much funnier. I'll be the first to admit that I usually don't find these types of movies as funny as most people do, so I'm probably a poor judge. Of all of the comedies that Robert DeNiro has played (that I have seen) I would rank this one an extremely distant third behind Analyze This and Midnight Run, both of which are absolute classics. DeNiro, himself, was excellent in "Meet the Parents" (is he ever NOT fantastic? ), but the movie itself was mediocre. It was an entire movie based on poor Ben Stiller spending a weekend at his future in-laws for the first time, where slapstick misunderstanding, and mishap after mishap goes wrong to make his future father-in-law (DeNiro) despise him. It had a number of genuinely hysterical lines, but between those lines you just sat waiting for the next predictable thing to go wrong for Stiller. The best scene is between Ben Stiller and the flight attendant at the end of the movie. It was cute, but definitely a better $3 rental than a $15 double-date investment. Men of Honor is a based-on-a-true-story movie about the genuinely heroic first ever African-American U.S. Navy Master Chief diver (Cuba Gooding) who later becomes the first U.S. Navy master diver with a prosthesis. The story, which chronicles his life from his enlisting in the Navy in the late '40's thru the days after he loses his leg in the '60's, weaves deeply into the overcoming of bigotry and racism that was rampant during this period of time. The absurdity of this kind of thinking really smacks you in the face. Fewer injustices are more infuriating than extreme prejudice. Thankfully good will towards all men is triumphant in the end, making this an endearing feel-good heart-warming movie for the cold winter months, albeit sometimes overacted, overdramatized and predictable. It's the classic saga of overcoming obstacles. Robert DeNiro plays a tenured Master Chief diver and Gooding's adversary - a brash foul-mouthed tough racist southerner with a drinking problem who initially seeks to see Gooding's character fail before finally realizing that he deserving. DeNiro is, as usual, brilliant. Bev and I discussed on the way home how you can feel like you actually know some popular actors and actresses because they are simply playing themselves in EVERY role. This is NOT true of DeNiro who acts out yet another complex and intriguing individual with aplomb. Also, I just HATE when Hollywood overdoes a good movie by adding the proverbial "young cocky hated-by-every-one corporate man-in-charge" who shows up to ruin the party, so to speak. C'mon, the movie was fine without it. I was disappointed the writers felt the need to add that extra old-school vs. new-school bit at the end - very cliché, very unnecessary. It's elimination would have been another way to shorten this movie up a little. What was with that submarine scene? That was a little hokey all-around. There's no way that could have actually happened, could it? All-in-all, however, an above-average movie. You'll be moved by the hatred, uplifted by the overcoming of that hatred and inspired by the human spirit and determination - and that is the kind of emotion you are supposed to get from a movie like this. Recommended. Not bad--not nearly as bad as the critics would have you believe. James Gandolfini is amazingly good. Really a sweet little movie, with just a splash of gore here and there. Definitely worth renting and a good "date movie." Not really a guy-type flick but my husband still liked it a lot. This was probably the worst movie that Hugh Grant has done to date. I'm always surprised just how many people haven't even heard of this movie when I mention it as one of my all-time favorites. It was nominated by the Golden Globes in 1989 for movie of the year, while Robert DeNiro was nominated for best actor for his role in this movie. In fact, this movie is worth seeing just to get a glimpse of a younger Robert DeNiro. Charles Grodin plays an sensitive accountant to embezzled $15 million from the mob and gave it all to charity. DeNiro plays an ex-cop who is now a cynical bounty hunter hired to bring Grodin back to justice. He begins what he believes will be a standard trip to get his captive back from New York to L.A. To complicate maters, the FBI are also after Grodin in an effort to get him to testify against mobster Jimmy Serrano (played by Dennis Farina. )...AND, there's the issue of a second bounty hunter hired by the bond bailsmen to do the same job as DeNiro...and, of course, the mob is chasing him down because they want Grodin dead. So, the bickering pair suffer a riotous trip across country via plane, train and bus to avoid their pursuers. There are plot twists galore that I won't get into so as not to ruin the plot for anyone who hasn't seen this. Surprisingly this is NOT simply an action packed drama - it's hysterical! It's so very rare for a movie to be able to capture subtle humor in a drama as this one does. This is a masterpiece. The dialog between DeNiro and Grodin goes down in history as some of the best back-and-forth banter and comedic timing that you'll ever see on film. All of the film's characters are colorful and memorable and dimensional. The interaction between them is intricate, but not so much so that the audience gets lost. It's balanced between action, humor and character development. It's funny yet sensitive. It's full of action yet thoughtful. The casting is wonderful - DeNiro and Grodin make the perfect odd-couple. If you haven't seen this, you MUST MUST MUST rent it as soon as possible! Possibly the best movie of 2004 as far as I'm concerned. It's been a long time since I've seen a movie where I've felt so emotionally connected with the characters as this. THAT is when you know you have a great movie - when the scenes unfold and you completely forget that you are in a theater watching a movie. Don't be deceived into thinking this is just a movie about boxing. Although the backdrop of the movie is indeed boxing, this is much more a movie about people, life's constant struggles, the tremendous force of will, the joy of a common spirit, a sense of family from the unlikeliest of places, exasperation, inspiration, heart and courage than it is about boxing. Clint Eastwood is absolutely brilliant, as is Hilary Swank. Both deserve all of the accolades that they've been getting about this movie. And Morgan Freeman is icing on the cake. (Has this guy ever been in a bad movie? Has he ever given a poor performance?) Standing ovation for all three of them, and for the movie as a whole as far as I'm concerned. My only complaint is that I pretty much wanted to shoot myself after the movie was over. An uplifter this is not. So I guess if you love fantastic films that make you want to put a bullet into your skull, this is your movie! Seriously though - go see this, depressing or not, this is a must-see movie. One of the top five worst movies I've ever seen. Unbearably slow and completely hackneyed. OK, do I hate myself? I didn't think I hated myself, but I must because I just rented "In the Bedroom" AND this methodical cesspool of depression on consecutive weekends. Let's recap the fun, shall we? In the first half of the movie alone we see: a lower class family torn apart by the fact that their father is on death row, you see the electrocution, you see a young kid getting berated by his mother because he's incredibly obese, you see the young kid die because he got hit by a car (hit and run, of course), and you see another family of bigots whose son commits suicide because his father thinks he is "weak." We know he thinks he is weak because that's what he says about his son at the funeral. What a pick-me-up this was! Like "In the Bedroom", this one also moves along sloooooooooooooow. You could kind of see what was going to happen, but at least it was a surprise because I couldn't see what the point was going to end up being. Unfortunately, in the end, I saw the point, but I didn't really care. Quite frankly, I didn't find the story all that interesting. Anyway, in summary, Halle Berry's husband is put to death early in the movie and then struggles to continue her existence financially. Billy Bob, meanwhile, is a correctional officer at the prison where Berry's husband was executed. Heath Ledger plays Billy Bob's son who also works at the prison. Ledger shoots himself after being berated by Billy Bob for screwing up during the execution process. Later, Berry and Billy Bob's paths cross, and Billy Bob begins to change his ways as the two form an odd couple of lovers. Oh, how nice. Too late for nice - I was already too depressed. Peter Boyle plays Billy Bob's bigot father. Which came first? This movie or "Everybody Loves Raymond"? Peter Boyle also plays the father on "Raymond" and as best I can tell - it's the same character! Weird. The thing is, on "Raymond" he acts like a dim-witted jerk, but it's funny. In this movie, he's just a jerk. Also like "In the Bedroom," the actors and actresses in this movie got many kudos for their performances. I guess it was well done, but I don't see what the big deal is with acting like lower-class simpletons full of hate. There are lots of people who do that every day and they aren't even acting. From the creators of "Toy Story" comes another clever tale, this one about the world of monsters which gets its energy from a power utility called Monsters Inc. Unlike the electric utility that powers homes in the human world, the monster world is powered by the screams of children. The movie stars a dynamic duo of "Sulley" (John Goodman), a fuzzy green and purple hulking monster whose exterior hides a heart of gold, and "Mike Wazowski" (Billy Crystal) a feisty green bowling-ball of a monster with one gigantic eye. "Sulley" and Mike are the leading kid-scarer duo at Monsters, Inc. where the scare monsters go thru doors in the monster world into the bedrooms of small children. The funny part is - or is supposed to be - the monsters are more scared of the kids than the kids are of them. The great part of this genre of movies for adults is the subtle adult humor and various slap-stick lines that would go over the heads of the kids in the audience. There are a few lines here that make you chuckle, but as far as that goes, Monsters Inc. falls way short of the edgy adult funny stuff compared to the likes of Shrek, Toy Story or even movies like Bugs Life. I'm sure it's a great movie for kids, although again I think even kids would find Shrek and Toy Story better. At times I just thought the plot lacked the depth of previous successes and ran a little bit too much like a Warner-Brothers early morning cartoon, but with 21st century animation. Richard Gere plays a political writer for the Washington Post whose wife (played by Debra Messing) is in a car accident very early in the movie. Gere is haunted by her last words and some scribblings she made in a notebook just before she died. Two years later while on his way to Richmond for a story, he unexplainably winds up 400 miles off-course in a small town named "Point Pleasant" in West Virginia, where strange things have been going on. The "strange things" get even more strange once Gere arrives. The story is based (presumably loosely) on real events. As I understand it, the strange occurrences all were truly reported in a very brief period of time in this West Virginian town in the late 60's (Of course, this is West Virginia we're talking about - I've got to think a bunch of redneck yahoos are reporting strange occurrences almost daily.) And the tragic event (which I won't reveal) at the end of the movie, did actually happen in Point Pleasant, albeit not during the same period of time as the "strange occurrences" in the 60's. The rest of the story and the characters are fabricated. As they were never explained in real live, nothing is explained in this movie either. It's just one creepy event after another, then the tragic event, and then the movie ends without explanation. As Bev noted, "They obviously made up the story, so why not make up an explanation?" Actually, one of the supporting characters, an expert on the supernatural, even states, "What you really want to know is 'why you?' Well, we aren't supposed to know." And you don't. So if you don't like movies with a definitive ending, this one isn't for you. In that regard, this movie REALLY reminded me of an episode of the X-files. I really think if you love the X-files, you'll love this movie...well, I guess, if you would pay $3.50 to rent an episode of the X-files. It wasn't a great movie, but it was a worthy rental - creepy enough that I needed to watch "Mad TV" before I went to bed to rid myself of the creepies still in my system! Can someone please explain to me why so many people are so damn nostalgic about Che Guevara? I mean, come on--this is a guy who, among other things, predicted and wished for a violent race war here in America, one that would have killed hundreds of thousands of people of every color. Needless to say, a movie with a sympathetic portrayal of Che is a tall order for me; that said, I was surprised at how close this movie came to sealing the deal. It's set in 1952, the year that young Ernesto Guevara (he hadn't gotten his nickname or his radicalism yet) and his best friend and fellow medical student Alberto (Rodrigo de la Serna) took a motorcycle trip across South America from their home in Argentina to a job opportunity in Venezuela. As the two men discover the awesome beauty and horrible poverty of their home continent, the movie does quite a job contrasting their personalities--Ernesto, troubled by the injustice he sees and by his own problem (a bad case of asthma), is guileless, honest, and dignified; Alberto comes across more as funny, worldly and practical, and not surprisingly ends up as the audience character. I'm oversimplifying a bit here--both men are a bit more complicated than you end up expecting, and what Ernesto eventually became is hinted at here and there--but the characterization is definitely the movie's main strength. I still had mixed feelings about the actor playing Ernesto, Gael Garcia Bernal from the Mexican film Y Tu Mama Tambien. He strikes me as the Mexican Tom Cruise--great-looking and not a horrible actor, but outclassed by those around him, and a bit too willing to coast on his star power. Luckily, he's in a role that more or less suits him, just as Cruise was in Rain Man (which this movie somewhat resembles), so his performance ends up not stellar, but not too bad, either. That, combined with the great performance of de la Serna, meant that I still enjoyed the whole thing a lot more than I expected to, so I have to be generous rating it. I'm not gay, but if I were this movie would be getting five stars. If you don't like musicals, shiny costumes, or Ewan McGregor in anything other than "Trainspotting" then stay really far away. But if you want to hear Nirvana set in 19th century Paris and some really fine acting by Nicole Kidman then rent this film. The hype and accolades are deserved. Um, yeah, OK, Drew. Whatever you say. Clearly you have a strange man-love for Ewan McGregor. If you think you'd rather be stabbed in the eye than have to watch a movie musical, particularly one with Nirvana songs being sung by characters from the 19th century, then stay far, far away from this movie. Nicole Kidman is VERY pretty, and so is Ewan McGregor, I guess. The movie is ridiculous. I have no one to blame but myself for seeing this movie. I even talked my husband and two friends into going with me. I'll miss them. Adam Sandler cracks me up -- in small doses. I love his song parodies and some of his sketches and characters on Saturday Night Live were nothing less than hysterical, but a full-length feature film just didn't cut it. Mr. Deeds is the story of a small town pizza shop owner and all around good guy who finds out that he has inherited $40 billion from an uncle he never knew he had. Take a small town guy, throw him in big, bad New York City, add some smarmy executives that want him to sign over his shares of his uncle's company so they can make BIG bucks, and sprinkle with a dash of the tabloid television journalist who just wants to get the scoop on the new billionaire in town, and crank up the laugh meter, right? Wrong. The movie has a few funny moments (mostly seen in the trailers for the film), but overall, it's just stupid. It's predictable and juvenile and I should have known better. Shame on me. But, after having sat through "Windtalkers" (at the insistence of my husband), I would have agreed to see "Lilo and Stitch." Save your money -- you'll get more laughs from Comedy Central's reruns of old SNL than you will from Mr. Deeds. Being a fan of Albert Brooks, I gave it a shot. It was pure fluff, but entertaining. Very funny movie; good cast, good story. The type of film with lines that make you giggle the next day, as you fondly consider how close they hit to home. If you wait for the video you won't lose much. There are no special effects that need to be seen at the theatre. Nia Vardalos plays Toula Portokalos, a woman trapped within her Greek heritage. As she puts it, the role of a Greek woman according to her old-school father is to marry a Greek Orthodox Man, make lots of Greek babies and cook Greek food all day long for the rest of her life. Unfortunately, the homely Vardalos is now 30-years old, unmarried and still working at the family-owned Greek restaurant as a waitress. Soon after the movie begins, Toula begins her quest to discover her own personal self worth, and winds up falling for Ian Miller, a tall, handsome, semi-long haired high school teacher who is most definitely NOT Greek. The comical meshing of their two families begins. That's pretty much the movie in a nutshell. Warm-hearted, romantic, uplifting. It's good for a number of smiles and an equal amount of laughs. The story is cute, the characters are just as cute, genuine and well cast. My guess is that non-Greek women will like this one more than non-Greek men. Greeks and anyone with close Greek friends will find this movie to be absolutely hysterical. What's interesting about this movie is how it all came to fruition. It wasn't even run in main-stream theaters when it was first released. It's a classic low-budget film ($5M total to make!) with a little-known cast that came out of no-where to make it big. Nia Vardalos, who plays the lead-character, inspired by her eccentric, good-natured family and colorful childhood, actually began wrote "My Big Fat Greek Wedding" as a play as early as 1993. Much of it was based on her own memorable wedding, and the events leading up to it. The play quickly became a stage hit. Rita Wilson saw the play, and recommended it to her husband, TOM HANKS, who agreed that the play would make a fantastic film. Vardalos faced a lot of adversity as executives, eager to cast major stars, wanted to tinker with the script. But she stuck to her guns, and with a paltry budget of only $5M, the gamble paid off as word-of-mouth found audiences flocking to the film in record numbers. Recommended. No need to run out and lay down $7.50 for it in a theater, but it's a more than worthy rental if you're looking for something light and refreshing. When Captain Amazing is kidnapped by the ruthless Casanova Frankenstein, it's up to a group of self-made superheroes to save the day. (I got that from the Blockbuster box.) The movie starts slowly, moves slowly to the midpoint and finishes poorly. It has some funny parts, but not enough to recommend the film. Good cast, bad story line. I just got done watching "Crash" a few weeks ago, and the box said "Best American Movie since MYSTIC RIVER" so we got this one too since we're apparently a glutton for dark and depressing stories. This one is worth seeing, but I agree with Jill (see below). The revealing of who did it was a slight let down, but I didn't think it detracted from the movie as much as it would in most cases, because the revealing of the "who did it" part was really secondary to the characters and how they got to that point in the first place. It's a testament to how strong the rest of the movie was, really. If you like high-quality disturbing brilliantly-acted movies, this one's for you. A solid 4-star film. IMPORTANT!!!!! DO NOT READ MY COMMENTS (particularly the second paragraph) IF YOU DO NOT WANT TO KNOW THE ENDING OF THE MOVIE BEFORE YOU SEE IT! The characterization in this movie is its #1 strength--I know some folks who aren't fans of Kevin Bacon or Sean Penn, but these two guys, along with the always terrific Tim Robbins, do a great job portraying the 3 adult friends haunted by childhood secrets. Lawrence Fishburne turns in a notable performance also as Kevin Bacon's cop partner. My biggest pet peeve is the ending of the movie when a deaf person and his friend are revealed as the villains of the crime. As a deaf person myself, I resent it when Hollywood resorts to portraying deaf people as deviant, and therefore, bad. Also, I felt that, in the context of the story, for it to end this way was a cop-out in terms of the plot. Some would say that the ending was an interesting twist in light of the events that unraveled as the movie played itself out. I can see where that view comes from, but I ultimately think the ending is a cop-out. This paragraph will make WAY more sense when you've seen the movie. I'd be interested in what others think of the ending.